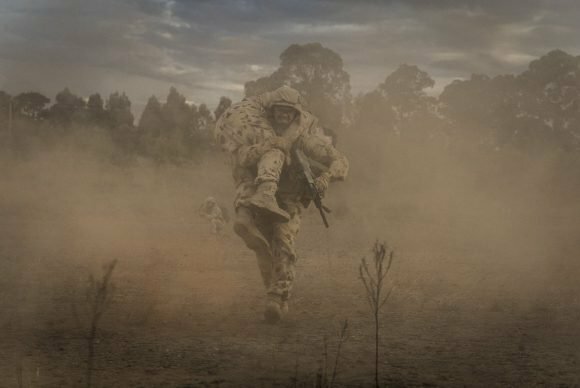 ☆☆☆☆ “Well meaning but imperfect new local drama that explores the experience of Australian soldiers both in combat and at home. It’s a good idea – an important one, even – but unfortunately the characters tend to simply act as vessels for various issues rather than fully rounded human beings. And if we struggle to care about the people, it makes it hard to engage with those issues – which is a shame, because Fighting Season’s heart is unquestionably in the right place.” — Sydney Morning Herald. ☆☆☆☆ “It revolves around a group of Aussie soldiers returning from the Afghanistan war, and the impact that conflict had upon them and their families. There’s also an unfolding mystery about something deeply disturbing that happened over there before the soldiers’ return. This is quality drama – good acting from Ewen Leslie, Jay Ryan, Lucy Bell, Kate Mulvany, Rhys Muldoon and Jay Laga’aia, the story has great currency, and it’s well structured around a compelling mystery.” — Who. ☆☆☆☆ “While writer Blake Ashyford explores the harsh reality of returning to Australia life – from finding girlfriends have moved on to addiction, isolation and psychologist sessions – it is contrasted with a mystery element around what really happened on the ground. These are depicted through various flashback scenes. But it is Jay Ryan at the centre of this tale, bottling Speedo’s anger and struggling to face emotions. Light years away from his Neighbours and Go Girls days, he has tapped into an inward acting style that draws in binge viewers.” — TV Tonight. ☆☆☆☆ “It’s a compelling mystery centred around a possible conspiracy between the men and at the same time an intense psychological drama where the lines between killer and family man, hero and victim, are constantly shifting. Ayshford calls it ‘a blend of genres – heartfelt emotion stories and high-octane action, because that represents the life that the soldiers and their families have.” — The Australian.